The Jones Carbon Flagship Snowboard is a seriously stiff shred stick for all you balls-to-the-wall, go-fast-or-go-home freeriders. Ideal for high speed stability in high consequence terrain, this board is not only powerful and responsive, but also wicked light! When it comes to riding big mountain lines, don't settle for mediocrity -- saddle up the Jones Carbon Flagship and start checking off your list of dream lines, one after the other. Directional Rocker  A hybrid rocker/camber flex pattern defined by more tip rocker then tail rocker and camber between the bindings. The rockered tip floats the board’s nose and improves maneuverability while the camber underfoot provides edge hold and response. A slightly rockered tail maintains the power and stability of a traditional board but helps keep the tail catch-free initiating turns and landing switch. 3D Contour Base 3.0  Freeride focused 3D-base contours featuring an even balance of 7mm of spoon bevel in the nose and 7mm of spoon bevel in the tail. Spoon bevel starts at the rocker point. Progressive Sidecut  At the far ends of the sidecut, the radius is incrementally increased as the edge reaches the contact point. Gradually increasing the sidecut radius towards the contact point delivers smoother turn initiation and exit as the edge tracks in and out of the snow with a less abrupt transition. Power Core  Triple-density full wood core featuring hardwood bamboo stringers for added pop and durability plus paulownia for weight savings. 2x TeXtreme® Carbon  Specially designed carbon fiber (12k non-crimp fabric) that is podium proven in the America's Cup and Tour De France. TeXtreme achieves a weight savings of about 20-30% compared to conventional carbon fiber. 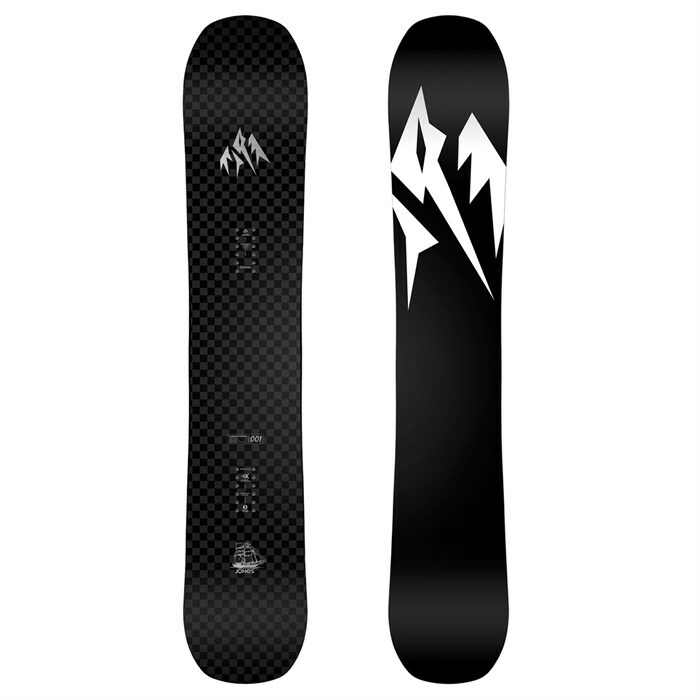 Recycled ABS Sidewalls  ABS plastic is one of the necessary evils of snowboard production. Jones improves the sustainability of their snowboards by using only recycled plastic. Sintered Ultra Base  World Cup proven race base made from Ultra-High Molecular Weight Polyethylene (UHMW-PE) modified with special Fluoro and Paraffin based additives for better glide and increased durability. Ultra base is harder and faster than any other sintered base. Oversized Recycled Edges  All Jones boards are made with oversized recycled steel edges for added durability and improved production sustainability. Traction Tech  Like a serrated knife slicing into the snow, Traction Tech improves your edge grip by adding multiple contact points along the running length of your board. Fusion Tech  Jones' exclusive production process allows traditional topsheet layer to be replaced with ultra durable epoxy layer for saving weight and material. Eco-Plastic Topsheet  Bio-plastic topsheet made from Castor beans. This eco-material is ultralight, chip/scratch resistant and water/snow repellent (snow sticks less to topsheet). Factory Tuned  All Jones snowboards are factory de-tuned at the tip and tail so you can go right from the shop to the mountain. Wend Natural Wax  Jones boards are ready to shred straight out of the shop and are factory waxed with WEND natural wax. Very Stiff The amount a snowboard flexes varies significantly between boards. Snowboard flex ratings are not necessarily standardized across manufacturers, so the flex may vary from brand to brand. Many manufacturers will give a number rating ranging from 1-10, 1 being softest and 10 being stiffest. Here at evo we have standardized the manufacturers' number ratings to a feel rating ranging from soft to very stiff. Generally you will find flex ratings of 1-2 as soft, 3-5 as medium, 6-8 as stiff, and 9-10 as very stiff. Flex ratings and feel may ultimately vary from snowboard to snowboard.